Båly harbour in the southern municipality of Lindesnes hosted a successful cruise-in-company event in 2015. Lindesnes point with its characteristic lighthouse is Norway’s southernmost mainland point. The area is known for its outdoor life and boating activities, offering a range of different activities for locals and crew alike. Sirevåg harbour has become a part of the North Sea tall ships family since its first cruise-in-company event in 2015. Now it is getting itself ready for an even larger event in 2018, organised by the municipality of Hå together with local organisations and businesses. Tananger is a historical port in Sola municipality on the North Sea coast, a short day’s sailing on to Stavanger. The port is proud of its maritime history and invites tall ships to take part in its cruise-in-company event. 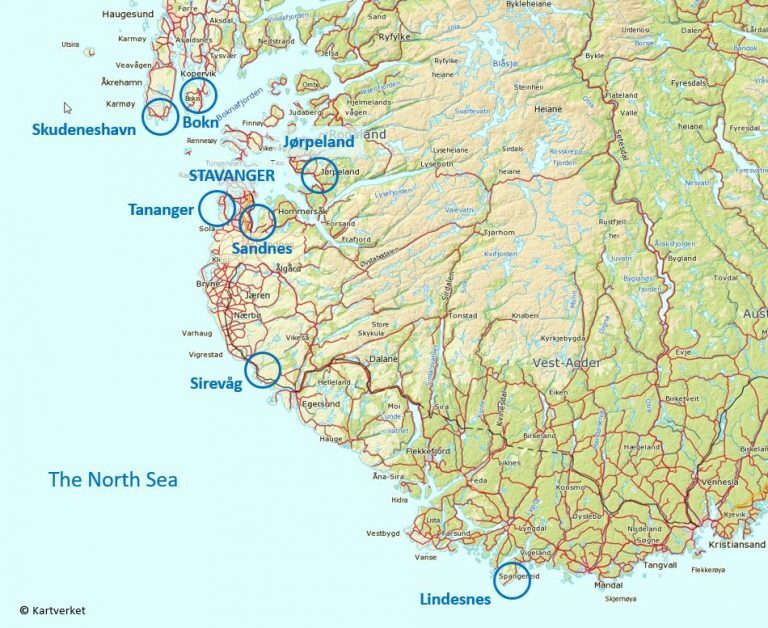 Stavanger’s international airport is only nine kilometres away. Skudeneshavn on the southern tip of the Karmøy island slightly north of Stavanger has a long standing maritime history. This charming little town is the perfect setting for visiting tall ships and the locals surely know how to make a cruise-in company event a success for everyone, like they did during The Tall Ships Races in 2014. The municipality of Bokn northwest of Stavanger offers islands and sounds with easy Access to the wider fjords leading to Stavanger. The village of Føresvik will be ready to welcome all visiting tall ships. The town of Sandnes lies at the southern end of the Gandsfjord east of Stavanger. The town offers all facilities including a deep-water inner harbour – Vågen – in the town centre. In Danish waters, the west coast port of Thyborøn offers similar visits. Please contact The Tall Ships Races 2018 Esbjerg for further information. Sail Training International, The Tall Ships Races 2018 Stavanger and The Tall Ships Races 2018 Esbjerg will not be held responsible for errors or omissions in information in the cruise-in-company program.